PLEASE NOTE: Travel to Englewood, Colorado is required as part of the Freedom Service Dog training program. A completed background check for all adults in the household 18 years of age and older is required in order for us to schedule an interview. Once you complete the application, each individual who needs to complete a background check will receive the link via email. A conviction will not necessarily prevent you from receiving a dog. FSD will keep your entire application confidential. Your video/photo and written application will become the property of Freedom Service Dogs, Inc.
To start the process clients must submit a complete application. The application must be completed in one sitting. We do require a medical/mental health assessment, letters of references and a photo/video portion. Interviews will be scheduled only when all portions of the application have been received. Below is a list of frequently asked questions about applying for a service dog from Freedom Service Dogs. We encourage you to read through this list before filling out an application. What type of service dogs do you train? We train dogs for mobility disabilities, Veterans with PTSD and Traumatic Brain Injuries, and children and teens on the autism spectrum and other neurocognitive disabilities. How do I get a service dog from FSD? Start by completing an application. Once you have completed the application and submitted it to us, we will schedule an interview with you. If you live in Colorado, we will ask you to come to our facility for the interview. If you live out of state, we will conduct the interview via SKYPE. Once we have interviewed you, our team will determine if we can meet your needs and if we are a good fit for one another. If the answer is yes, we will send you an acceptance letter and put you on our waitlist. If the answer is no, we will send you a letter explaining why we cannot accept you as a client. Once you are accepted, the wait time will depend on the program in which you are participating. Please note wait times are generally 12-18 months; however, if you need a dog for brace and balance, have specific breed or size requirements, or need particularly challenging or complex tasks, the wait time can be longer. When we think we have a dog for you, we will ask you to come to our facility and meet the dog. If you live out of state, travelling to Colorado to meet your potential dog is a requirement of the program. If you and your dog love each other, then we consider that a match and prepare for placement class. If you don’t feel like the dog is the right fit for you, or the dog seems uncomfortable for any reason, we will keep looking for another match for you. Traditional: The FSD trainer works with the dog for 6 – 9 months and the client will participate in a two-week placement class at the FSD facility with an additional week taking place in the home of the client. If you live out of state, all travel and lodging expenses will be your responsibility. During the two-week group placement class, we will teach how to work with your dog, take care of your dog and go on public outings. After the 2 week class is over, your trainer will come and work with you in your home or community for a third week regardless of where you live. After that, we offer lifetime support for all of our dogs, so if any issues arise, we will help you address them. Disco’s Dogs: This program is for families with a child on the autism spectrum or with other neurocognitive disabilities. In this training program, the family will participate in a 26 week training program. Participants are required to live within driving distance of the FSD facility or be willing to temporarily move to allow for full participation in the program. Operation Full Circle: This program is for veterans with post-traumatic stress disorder. In this training program, the veteran will participate in a 16 week training program. Participants are required to live within driving distance of the FSD facility or be willing to temporarily move to allow full participation in the program. How much does it cost to get a dog from you? We do not charge a fee for our dogs. If you live out of state, all travel and lodging expenses will be your responsibility. We do not have lodging on-site but we are happy to recommend lodging options. I see there is a financial worksheet in the application. Do I need to be rich to get a dog from you? No, you do not need to be rich. Many of our clients live on some type of fixed income. However, you must be financially stable enough to provide for your dog’s needs. This includes daily needs like food and treats, as well as emergency medical care. How long does it take to get my dog? Once we have interviewed and accepted you, the wait time depends on the training program in which you are participating but the typical wait is 12-18 months. However, if you are looking for a dog for brace and balance, have specific breed or size requirements, or need particularly challenging or complex tasks, the wait time can be longer. I am unable to travel to Colorado. Can I still get a dog from you? Unfortunately, coming to our facility to meet a dog and the subsequent training/placement class are both requirements of our program. Our staff is simply too small to travel all over the country to try and match dogs and place them. We are happy to discuss your options with you and recommend service dog agencies that may be closer to where you live. What type of breeds do you work with? Most of our dogs come from rescues and shelters in Colorado and the surrounding states. Therefore, we work with many different types of breeds and many mixed breed dogs. Most of our dogs are 40lbs and larger and between 1-2 years old. Smaller dogs may be available for children on the autism spectrum or with other neurocognitive disabilities. Can I pick what type of breed I want? You can give us input into what type of dog you would like, but there is no way for us to guarantee a specific breed of dog. If you are very particular about what type of dog you want, the wait time can increase dramatically. Can you train a dog I currently own as a service dog? No, we cannot train dogs that are currently owned by individuals. If you want to train your personal dog, please visit assistancedogsinternational.org to find a program that can help. Can I purchase a dog for you to train? No, we cannot accept dogs to train for specific individuals. Our selection process is extremely rigorous and the likelihood of a dog you choose meeting our criteria is slim. Additionally, if we accept a dog that is slated for you specifically, then that would mean bypassing the waitlist and receiving a dog from us long before others who have been waiting for their dog. Do you train dogs for children with Autism? Yes, we do. We serve children as young as 5 years of age through our Disco’s Dogs training program. However, we have a 12 year age minimum for our Traditional training program. Can my child with Autism take their dog to school? In most cases, no. For safety reasons (both for the dog and the child) we cannot allow a child to be in control of a dog in a public place without a parent present. Can my child with Autism be tethered to their dog? No, we do not allow tethering. Although our dogs are extremely well trained, there are always circumstances where a dog can bolt (either because they are scared, or because SQUIRREL!) and that would present a very unsafe situation for the child. Do you train dogs for PTSD? We train dogs for Veterans with PTSD. At this time we are not training dogs for PTSD for the general public. Do you train dogs for other psychiatric disorders? We do not. The only mental health diagnosis we train for is veterans with PTSD. If depression or anxiety are a part of your physical disability, we will not disqualify you. However, if you have a significant or severe mental health disorder, it may disqualify you from getting a dog from us. Do you train dogs for emotional support? We do not. Technically under the Americans with Disabilities Act, emotional support dogs do not have public access as they have not been trained specifically to mitigate a disability. Do you train therapy dogs? We do train therapy dogs for professional and/or licensed therapists and mental health professionals for use in their practice. FSD therapy dogs are trained to work with a professional therapist (psychiatrist, psychologist, occupational therapist, etc) to act as a therapeutic partner in their practice. A therapy dog is not meant to provide “therapy” to one single individual. Do you train seizure alert dogs? No, we do not train any type of medical alert dogs. Do you train Seeing Eye dogs? No, we do not train guide dogs for the blind. Do you train hearing dogs? No, we do not train dogs for the deaf. Do you train diabetic alert/allergy alert/stroke detection dogs? I really need a type of service dog that you do not currently train. Can you make an exception for me? Unfortunately, we cannot. Training dogs for other types of service requires a different set of training skills that we are not set up to accommodate. I see there is a background check in the application. Will you disqualify me if I have a criminal record? Not necessarily. We take each applicant’s criminal history on a case-by-case basis. 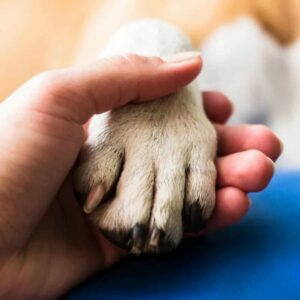 If you have a history of animal abuse or violent behavior towards people, it may disqualify you as that is a safety concern for both our dogs and our staff. I have a history of drug or alcohol abuse. Can I still apply? Yes, you are still welcome to apply. However, we ask that applicants have at least 1 year of sobriety before we will accept you onto the waitlist. I have a pet dog/cat/bird, etc. at home. Do I need to give up my pets in order to get a service dog? No, you do not need to get rid of any pets you currently own. We will find a dog for you that fits the current make-up of your household. However, we do ask that you not ADD any new pets to your home after you have been accepted. I really think that my friend/family member/neighbor needs a service dog. Can you convince them to apply? No, we will not try and convince anyone that this is the right path for them. Getting a service dog is a long, arduous process. Bringing a service dog into your home is like bringing a very smart 2-year-old toddler home to live with you. If you are not 100% dedicated to the process, you will not be a successful team. How much does it cost Freedom Service Dogs to place a dog? It costs us approximately $30,000 dollars to train and place a service dog. All of our funding comes from donations. Most of this funding comes from private donations, family foundations, and some government grants.